Richard and Betty Via have lived in their North Scranton home for over 30 years. Mr. Via, a Navy veteran and Armed Forces Expeditionary Medal recipient, uses a walker to get around due to arthritis in his knees. Mrs. Via had a knee replacement and uses a cane. Their physical limitations have led to a number of falls and made otherwise simple daily activities, like bathing, more difficult. The Vias formerly had a claw foot tub which was too high for either of them to get in and out of on their own, prompting them to use other less hygienic measures to bathe. 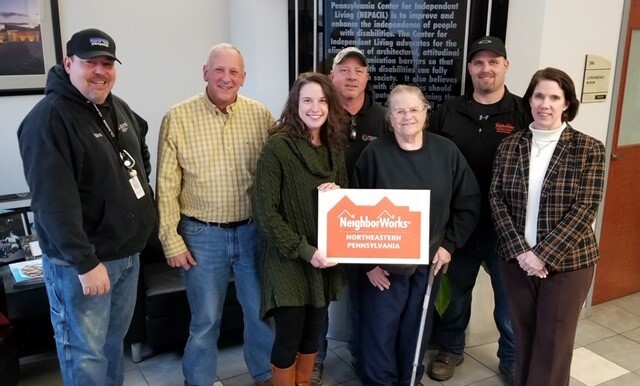 The Via’s were referred to NeighborWorks for critical safety modifications to assist them in staying in their home. In collaboration with the Veterans Resource Coalition, Lackawanna County, and Career Link, we worked with the Northeast Pennsylvania Center for Independent Living to install a walk-in shower to allow the Via's to bathe safely and with dignity. The project was funded by a Home Improvements and Structural Alterations (HISA) grant from the Veterans Administration, a Home Depot Foundation grant specifically designated for veterans, and funds from the Harry and Jeanette Weinberg Foundation for critical safety modifications for homeowners wishing to age in place. This past December, the Vias celebrated their 45th wedding anniversary. Mrs. Via had this to say about their new walk-in shower: "We are thrilled with the work. It’s been great. The guys [who installed the shower] were great. We are very pleased. Richard and I both feel much safer showering now." This summer, we plan to address the Vias' other home repair needs during our annual NeighborWorks Week volunteer home repair event.